WPP’s MediaCom has had its recent purple patch of wins confirmed, topping the chart for new business wins for the month of June. According to marketing tech firm R3’s latest data, MediaCom has stormed six spots from the previous month to come in at number one following new business wins that included Uber, Brand USA, American Airlines and PSA Group Global. Carat relinquished top spot but still managed to come in at number two, while Blue 449, Havas Media and OMD rounded out the top five for the month. 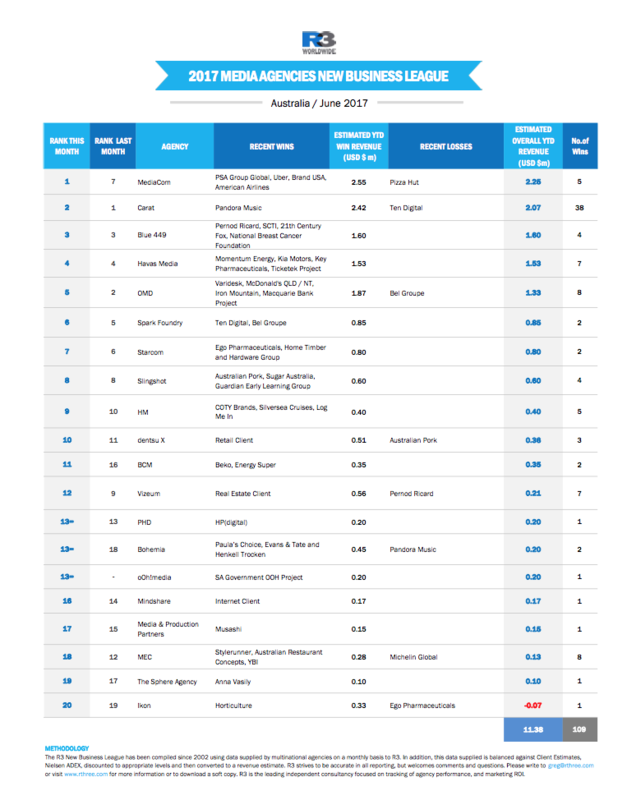 MediaCom’s move from seventh to fifth was the biggest move on the list for the month, followed by MEC jumping six spots from 18 to 12. The rest of the top 20 pretty much holding their spots or moving ever slightly.